Father Christmas must be fuming as unscrupulous imposters chip away at his carefully crafted, centuries-old brand. Every year, it seems to get worse. Just last week, homestyle consultant Laurence Llewelyn-Bowen was slammed after opening a third-rate, snowless grotto, where elves were spotted drinking and smoking and presents weren’t even wrapped. Meanwhile, youngsters in the Welsh town of Aberdare were left in tears on Saturday, after seeing Santa ‘arrested’ following an appearance at festive parade – that’s not the Xmas spirit. So, as our festive gift to Santa, atom42 offers some advice on how he can inject some ‘ho, ho, ho’ into his battered Christmas brand through online marketing. In-depth competitor analysis never fails to identify interesting parallels and opportunities for a brand. While Father Christmas does not have any direct competitors, we would seek to analyse relavant, Christmas-themed characters’ online profiles. Our focus for 2014 would be on The Snowman and Monty the Penguin. We would also look to analyse the market performance and online strategies of comparable seasonal characters, in particular the Easter Bunny. He might be at the top of the world, but he’s not at the top of Google, because poor old Santa doesn’t even have a website. 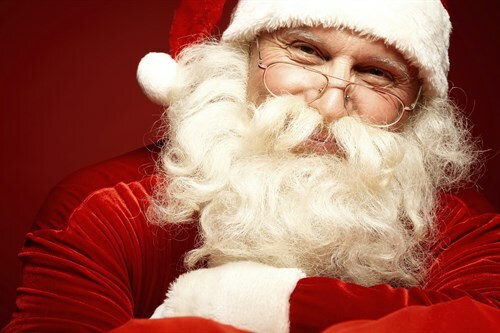 An official ‘Santa Claus’ website would help streamline the Christmas period for Santa and his elves. It would also help spread awareness about the magic of Christmas and the importance of being good ‘all year round’. Detailed keyword research and on-page targeting would ensure the site ranked well in the search engines for relevant, high volume terms including ‘Father Christmas address’ and ‘write a letter to Santa’. Having up-to-date contact details clearly visible on the homepage would ensure Christmas wishlists did not get lost in the post. A live email address and/or online contact form would further increase elf efficiency, as well as improving Santa’s ‘green’ credentials. While site imagery would focus on Santa Claus, we also see the character of Rudolph as playing a pivotal role in website branding. Rudolph’s very shiny nose is instantly recognisable, and the character also helps to instil the idea of Santa’s deep-rooted instinct for inclusiveness and fair play. If you remember, Rudolph was invited by Father Christmas to help pull his sleigh, in spite of his unconventional appearance. Creating high quality, shareable content will help to generate inbound links to the Santa Claus website. We would recommend website strategy to include the addition of a Father Christmas ‘blog’ on which to publish this content. Ideally, Santa will have a significant influence over what is published here. However, we do recognise that Santa has an extremely busy schedule. We would therefore help to generate ideas and insights, ensuring this content remained unique and timely. We also see plenty of opportunity to generate positive publicity and inbound links for the Santa Claus website through online PR. In this area we would leverage press contacts as well as reacting to Xmas-themed media requests. Deep linking PPC ads would ensure that users interested in finding out about Santa were directed to the most relevant page on the Santa Claus site. Meanwhile, a minimum of 30 recent reviews will ensure that star ratings appear in Father Christmas’s ads – particularly apt during the festive period. We would also recommend using the ads to help deliver the message of being good ‘all year round’. We aren’t talking about footprints in the snow, but rather the key marketing task of generating a fair and rounded online review footprint. This one, vital task would go a long way to helping reclaim the Santa Claus brand. We envisage the review collection process as being a reasonably straightforward task, given that the overall Santa Claus service tends to be very well received.